“Take your Saree to work” day is here and you are cordially invited to bring out those yards of understated glamour for the world to see! Wearing a saree to work may sound like a dated idea, but the truth is that the saree is not just making a comeback – it actually never really left. 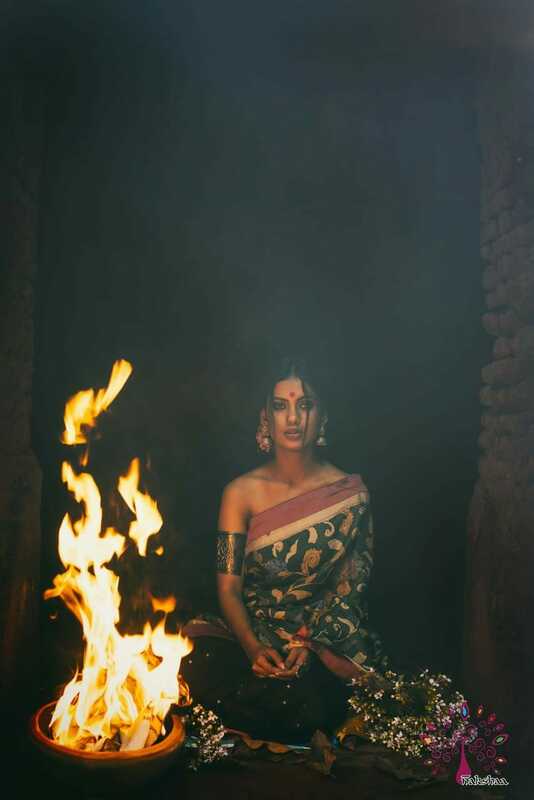 A piece of heritage that we have inherited from the Indus Valley Civilisation, the saree has made a mark on international runways and in the closet of the modern day lady alike. 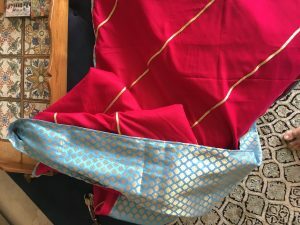 The saree is a garment that can be worn at home while cooking a meal, to a party or a wedding where you need to glitter and shine, or at work where you need to make a mark. The saree at work is a garment that can be subtle, glamourous and edgy – all at the same time. Simply pair a floral piece with a collared blouse, or a pastel one with a velvet shawl for a new statement everyday. Work in new accessories and watch as the saree at work goes from neutral to bohemian to girly and much more. Name each look after one day of the work week and you will accomplish more more than the typical western formal wardrobe can! Here are a few of our favourite ones by Nakshaa for The White Muslin! Tussar creates a gorgeous foundation with the rustle of richness and an earthy vibe at the same time. In fact nothing says understated elegance, like Tussar. 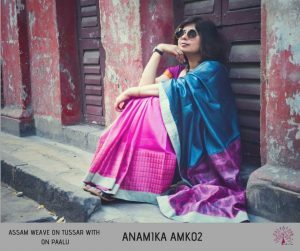 And when combined in vibrant hues and barely there block prints, this is the perfect choice if you want to take your saree to work! Take your style statement to artisan heights with this Kalamkari painted saree. The dramatic black panels make it perfect for formal wear while a contrast feminine hue keeps the fashionista in you alive! Glam up your saree with an Odhni draped creatively. You can either let it go around your shoulders like a snug shawl, or let it hang by your side. And if you truly want to make a mark, then cinch it with a belt and let it complement the earthy vibe of the saree! I am in love with this brocade encrusted piece by Designer Aekta Dhingra! The slim gota work and the brocade will add glamour and prettiness to any saree or outfit! In fact, you can pair it with a khadi style crop top and a bold hued pair of dhoti pants. Simply drape like a saree and secure with a cool belt. Your saree at work never looked better! If you are looking for a modern and practical pairing as you take your saree to work, you cannot go wrong with these pieces by StyleAura for The White Muslin! 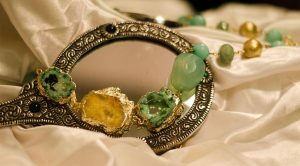 In fact, these pieces have been designed in a way that can affect your aura and render precious holistic healing thanks to the use of particular gemstones! I would ideally pair this necklace with its eclectic gems in an unfinished cut, to match the earthy goodness of the saree at work, and the glamourous odhni that you can pair with it! 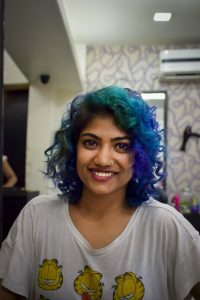 An edgy look that brings in vibrant aqua shades can be used on soft curls for a never seen before statement! Try this one, styled by Abhishek for Zulf.